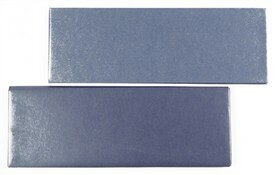 D-5690, White Color, Shimmery Finish Paper, Ribbon Layered Cards, Hindu Cards, Designer Multifaith Invitations. 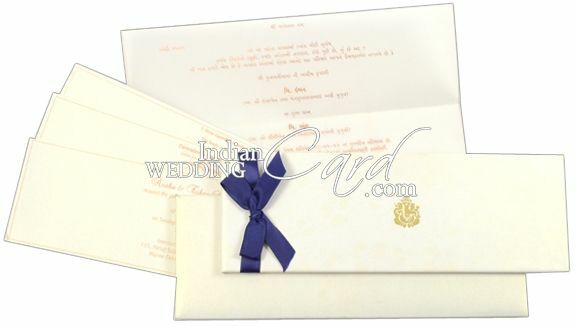 The front of this card and box has envelope has traditional floral design printed in pearl. Front also has golden hot foil printed Ganeshji in center. The inserts has bronze color line border. Pocket too has line border. White color shimmer paper (120gsm) for hardbound card and 250gsm paper for mailing box envelope, pocket and 2 inserts Tracing paper interleaf inside. Satin Ribbon bow on front.